Nbien is a relatively new name to us. Chances are it will also probably be a completely new name to many readers, although this Malaysian company has in fact already put in a couple of appearances at a few British hi-fi shows. And indeed, the country itself is already well established as a significant source of serious hi-fi speakers, since Malaysian interests purchased Acoustic Energy some years ago. 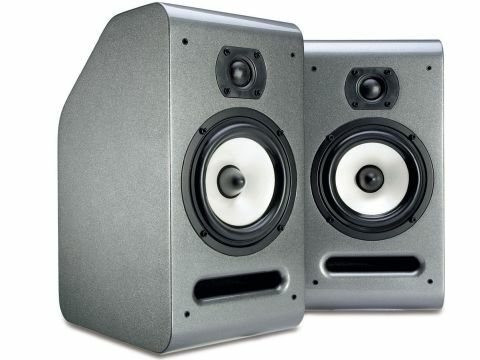 Nbien has four distinct ranges, and the three DX models include a centre channel and a floorstander alongside this small £250 per pair DX-5 standmount. Based around a 130mm bass/mid driver, loaded by a transmission-line style port, it manages to incorporate a number of unusual features. The enclosure comes in a variety of finishes; our samples were painted in high-gloss metallic graphite, but real-wood veneers are also available, which is surprising at such a modest price. The cabinet has an interestingly asymmetric elevation, with heavily post-formed horizontal edges and a large, angled slice taken out of the top and rear. Additional internal bracing and damping helps control cabinet vibrations, and a generous and nicely shaped front slot, on the end of a short folded line, port-loads the main driver. The main driver is also unusual, using a Fabric Ceramic Composite Technology (FCCT) cone with a diameter of 95mm, which combines a lightweight fabric substrate with a ceramic stiffener and fill. The fabric cone is coated with a resin and ceramic powder mix, before being hardened by repeated heating until any existing air gaps are filled. This composite is then coloured and doped with polymer damping material. The tweeter uses a 25mm soft fabric dome and twin terminal pairs are fitted on the rear. The good news is that this is an excellent little newcomer that richly deserves a seat at the grown-ups' hi-fi table. Although it's possible to use the DX5 out in free space, under these conditions the bass end is rather weak. Placing the speakers close to a wall certainly redressed the balance - indeed, if anything the bottom end was now a shade strong, the more obviously so because the treble end of things is distinctly restrained. More significantly, close-to-wall placement seems to suit this little loudspeaker particularly well, as its strong upper midband doesn't seem to be unduly disturbed by wall proximity, and colorations remain well controlled. Indeed, box coloration is exceptionally low here, and this little speaker proves remarkably effective at generating generous and spacious stereo images with a degree of weight and scale that's entirely surprising from such a compact device. To some extent this is a consequence of its relatively low sensitivity (it's always possible to trade off between sensitivity and bass extension), and the tilt in favour of extension will inevitably limit the speaker's ultimate loudness capability to a degree. While it's true that the top end is relatively restrained, the transition from midband to treble is handled so smoothly and gradually one is hardly aware that the treble is a little light, or indeed of the changeover from one driver to the other. Though not entirely neutral, the DX-5's excellent overall coherence, fine expression, good solidity and superior dynamic range all add up to an impressive 'budget' newcomer, representing excellent value for money. The paradox of loudspeakers is that measurements don't really say how good a loudspeaker will sound. The DX-5 gave measurements below the group average on every count, yet the sound quality judgement was entirely positive. The sensitivity rating is a low 85dB here, exactly as specified by the manufacturer, which is bound to place some limit on its loudness capability. And, although the load stays comfortably above six ohms for most of the band, it does dip down to around four ohms around 2.5kHz. The far-field in-room frequency response traces are neither particularly flat nor all that smooth, and would seem on balance to favour close-to-wall positioning, as this tends to balance up and therefore disguise the upper midband prominence. Certainly, the upper midband (700Hz-1.5kHz) is a little too strong on balance, and that in turn tends to make the rather restrained treble a little more obviously shy.